Make your way to the Oklahoma State Fair and celebrate the end of summer with endless carnival rides, delicious fair food and a wealth of agricultural, artistic and commercial exhibits. Oklahoma’s state fair draws over 1,000,000 visitors annually and features a variety of live performances, major attractions and countless competitions. There is literally something for everyone at the Oklahoma State Fair. Enjoy browsing through five exhibit halls, stop by the fair’s auto show to peruse new makes and models from Ford, Dodge, Honda, Jeep and more, or compete for prizes while trying your luck in the fair’s popular midway. Purchase an unlimited carnival ride wristband at the Oklahoma State Fair and enjoy a leisurely spin on a carousel or soar skyward on the massive Ferris wheel. Hit the family fun zone for activities perfect for young children including mini stock cars, bumper boats, a high-flying trampoline and a 25-ft rock wall for kids. Take a smooth ride down the fair’s giant slide or make your way through the fun house. If you’re looking for something more action-packed, have no fear. 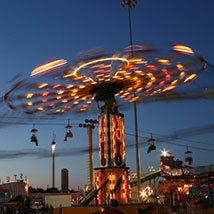 The Oklahoma State Fair will feature a number of heart-pumping rides perfect for adrenaline junkies. Test your courage on the Fireball, Enterprise, Mega Drop and more. The food is famous at the Oklahoma State Fair, so stop by and feast on huge cinnamon rolls dripping with icing, or cool off with an ice-cold jug of sweet root beer. There is something for every appetite at the Oklahoma State Fair including Indian tacos, funnel cakes, gyros, corn dogs, barbecue sandwiches, roasted corn on the cob, turkey legs and slices of piping-hot pizza. After grabbing a bite to eat, head inside and visit the Oklahoma expo halls for vendor booths and shopping opportunities galore. From agricultural products and wines, to jewelry and kitchen gadgets, the Oklahoma State Fair has it all. Visit the Oklahoma State Fair and don’t forget to catch one of the fair’s popular livestock or horse shows. Enjoy exciting PRCA rodeo action and stick around for a live concert following the event. Also, enjoy the hottest musical acts performing rock, country and pop during free concerts, held nightly.